Ashley Arnett was recognized at the 4th Annual Gala for her service to the children of Eaton County. Ashley was sworn in as a volunteer Court Appointed Special Advocate in Eaton County in November of 2013. She quickly became engaged with the program, and has been an advocate for 3 cases (on occasion serving on two cases at the same time). A foster care case worker assigned to Ashley's first case was so impressed with her work, that she requested her by name for her second case. Ashley works hard to ensure that the children's needs are met and the cases progress appropriately towards permanency. She develops good relationships with the children as well as the foster parents involved in her cases. She relates effectively with parents while maintaining her commitment to advocate for the children's best interest. She exercises good judgment in advocating for the children's care and safety, and is willing to stand for what she believes is right in the face of differing opinions. Ashley has been able to provide valuable detailed information to the Court to assist the Referee in making appropriate decisions for the children she represents. As an advocate, she has a nice balance of compassion and accountability. Ashley is committed to CASA's mission and has also volunteered to help with events in support of the program. Lisa Flower was recognized at the 4th Annual Gala for her service to the children of Barry County. Lisa was sworn in as a volunteer Court Appointed Special Advocate in Barry County in April of 2012. She has served as a CASA on four cases and is always eager to take on a new assignment. Lisa is very consistent in her work and she advocates sensitively for children. Her current case involves two children who have experienced severe sexual abuse and food deprivation, and she applies herself to learn how to effectively advocate and support the needs of children with highly sensitive issues. She has not given up on the oldest child who is now in a residential placement, and has been a consistent relationship for him throughout his placement changes. Lisa is committed to continued learning, and she regularly attends training opportunities to further her professional development. She is a high energy, compassionate person, whose nurturing spirit comes through to her kids. Her tenacity is admirable - never giving up and always having hope for the children. Congratulations to Deliah Underwood who was honored as the "Volunteer in the Spotlight” during the summer of 2014. Deliah is the mother of two beautiful daughters and is a Budget Analyst for the State of Michigan, a position which she has held since June of 2004. Being a CASA volunteer is not her first volunteer position. Deliah has been a “Growth Group” Leader at her church and a Youth Soccer Coach. Her passion is working with children and she is now attending the Weekend in Social Work Program at Michigan State University to pursue her passion for children and families. Deliah learned about the CASA program on the internet and applied to become a CASA in the fall of 2012. She was sworn in by Judge Byerley on February 12, 2013 and accepted her first case in March of 2013. The case involved a young girl who was removed from her home due the use of alcohol and illegal drugs by her parents. The child loved having Deliah come to visit while she was in foster care and the foster parents were very complimentary of Deliah and her work as an advocate for the child. She was able to effectively relate to the parents while maintaining a firm stance to advocate for the child’s best interest. This case resulted in the reunification of the child to her parents consistent with Deliah's recommendations. The case remained open for awhile after the child returned home, and the mother of the child respected the involvement and recommendations made by Deliah for both herself and her child. In one particular instance, Deliah supported the mother who was insecure in her parenting as she dealt with a tantrumming daughter who was testing her newly restored authority. Deliah identified the mother's strengths and reinforced her positive interactions with her daughter to address the behavior. The mother asked Deliah to stay as a support until her daughter eventually reached a point of release and there was a breakthrough in their relationship. Deliah was able to witness a beautiful work of restoration as the young girl's trust and confidence was restored in her mother. This is powerful - and it exemplifies the privilege and opportunity that CASA volunteers get just for simply being there and getting involved. Deliah's support through a stressful situation with the young mother's daughter made this breakthrough possible. Deliah's second case involved neglect by the mother of her two children. Deliah was very professional in her handling of this case and it also ended with the reunification of the children with their mother. Deliah assisted in our training of new volunteers by coming in and relating her experiences with both cases to the trainees. They stated that her presentation was very valuable to them and helped give them an insight in how to handle difficult situations when assigned to a case. Attorneys and the Court staff have recognized and complimented Deliah's work with children and families. Deliah, on behalf of the CASA Staff, CASA Board members and children who benefitted from your services congratulations and THANK YOU. We appreciate your service to children and families. Congratulations to Shelly Zamora who was honored with the 2013 Barry County Volunteer of the Year Award. Shelly is married and has raised 3 children and two step-children and has 5 grandchildren. Well, it may be six grandchildren by now, as she is in Arizona for the birth of her sixth grandchild. She served on the Board for a Child Care Program for ten years. Shelly knows some sign language and has been a volunteer in classrooms with deaf children. She was a letter carrier for the U.S. Postal Service for just over 11 years. You know the slogan, “Neither snow nor rain nor sleet nor gloom of night keeps these carriers from their appointed rounds”. Shelly applies the same dedication to her CASA cases. She loves to read and work on crafts plus knitting and crocheting when she has the time..
Shelly learned about CASA through a volunteer match and also through a friend on facebook. She had some free time and wanted to help make a difference in the life of a child or children. Shelly attended CASA training in the Spring of 2012 and was sworn-in in both Eaton and Barry counties. Although she lives in Eaton County, Shelly accepted her first case in Barry County in May of 2012 and drove approximately 45 minutes one way to see the young child she was advocating for. However, before this case ended with the reunification of the child to the mother, she accepted another Barry County case in October 2012 to help fellow CASA volunteer, Victoria Rea, in Barry County. While the mother of the child lived in Barry County, the father did not. Shelly was then working on two different cases in two different counties and keeping extremely busy. The second case was an extremely difficult case and the work of the CASA volunteers was essential in the positive outcome for the child. Shelly has just been assigned to her third case which is a little closer to home. She is now working with three children in the Eaton County area and doing an excellent job. Not only does Shelly do an outstanding job with her “CASA Kids”, she has been a great asset in fundraising events. She has helped with the CASA Gala and our Superhero run for the last two years. On behalf of the CASA Board, CASA staff and the children who need you, THANK YOU for being a CASA volunteer and congratulations on your selection as the “Volunteer In The Spotlight” for this quarter. Tammie Newhouse (pictured left above with Morgan from Barry County United Way), was the recipient of the 2012 Barry County CASA Volunteer award as well as the Everyday Heroes Barry County United Way Volunteer of the Year award. Tammie heard about the CASA program and decided that she would like to help children who needed a voice in the Barry County area. 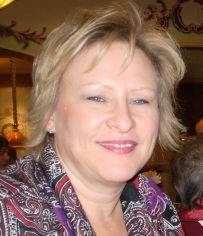 Tammie took her CASA training in Hastings in the fall of 2011 and accepted her first case in November of the same year. This was a case with two small children who had been removed from their parents due to neglect and/or abuse. Tammie visited these children weekly to see how they were doing and to make sure their needs were being met. She also kept track of the parents' progress with the treatment plans they had been given by the Department of Human Services in order to make well thought out recommendations in the best interest of the children. These recommendations along with any concerns she had were reported to the Judge approximately every 90 days. This case was finalized in January of 2013 with the adoption of the children. Tammie was there to support the adoptive parents and the two children being adopted. While still working on the above case, Tammie accepted another case in August of 2012 which involved five children who had just been reunited with their parents. DHS and the Court wanted someone to monitor this case to see how things were going in the home after the children's return home. This made a total of 7 children she was advocating for from August through November of 2012. She was totally committed to both cases and worked diligently and tirelessly to see that the children's needs were met and that the children were well cared for. Tammie just accepted her third case which involves three children. She is a strong advocate for the best interests of the child in and out of court. She is liked by all and well respected by DHS staff. She is an asset to the CASA program and to Barry County. She has contributed over 175 volunteer hours to help children in Barry County. Tammie always attends training meetings to keep abreast of new informaiton and changes in the program. She is always willing to help with any endeavor and is very deserving of the awards she has received. Congratulations to Candy Brandon-Watters who was chosen as our "Volunteer in the Spotlight" for this quarter and the 2014 Eaton County Volunteer of the Year. Candy is married and has one son. She understands the problems and pressures of being a single parent as she was in that position herself for a season. Candy's son is now married and she is the proud grandmother of two grandsons. This is not Candy's first volunteer position. She worked with at-risk mothers and also worked at Willow Plaza Teen Services. Candy was employed by Michigan Education Special Services Association (MESSA) and retired in 2007 after 30 years of service. One of Candy's hobbies is genealogy which she says fascinates her. Early in 2003 Candy was diagnosed with cancer. She received treatment from April 2003 through October 2004 and is proud to be a cancer survivor. Candy heard about the CASA program on the Dr. Phil Show and thought she would like to help. She stated that she had the time and the energy. She believes children need a voice and thought she could be that voice for a child or sibling group. She received her training in the spring of 2011 along with several other individuals in the Eaton County area. Candy was assigned to her first, and current, case in May of 2011. The child on her case has been assigned four different case workers since May of 2011. This shows how important it is to have a CASA on the case, and Candy has been an outstanding advocate for her assigned little boy’s best interest! Once again, congratulations to Candy on her selection as the Volunteer In The Spotlight and, also, on being a cancer survivor! And, on behalf of the CASA staff, CASA Board members and the children who need our help, THANK YOU for being a CASA volunteer.